A layer of dust covers every conceivable surface in houses in Samy Nagar in Tirusulam. The vehicles parked on the road have a thin film of grey over them. The drums used to store water have to be shut with heavy lids to prevent the dust from coming in. The curtains in the houses are always drawn tight, so as not to leave any room for passage of dust. But that blocks out the light too. The residents, particularly the women, are constantly dusting and cleaning their homes. “I’ve lived here for 15 years and this is how it has always been ever since the crushing units came here. The operations of the unit so close to our homes means we live with so much dust in the air constantly. 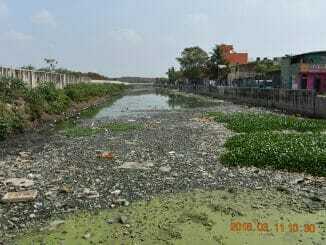 It is our reality”, says Ellaiammal of Samy Nagar 1st Street. 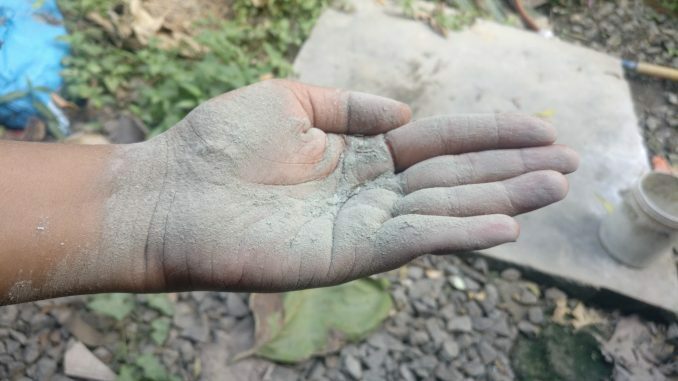 Quarrying activity around the hillock in Tirusulam has largely stopped, but the rock crushing units have turned into primary pollutants in the area affecting the lives of thousands of residents who live close to it. 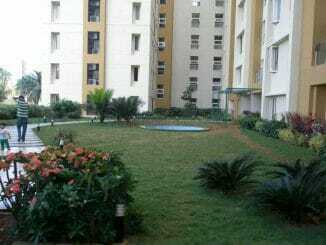 The crushing units are very close to the residential areas of Samy Nagar, Rani Anna Nagar and along the Moovarasampet main road. 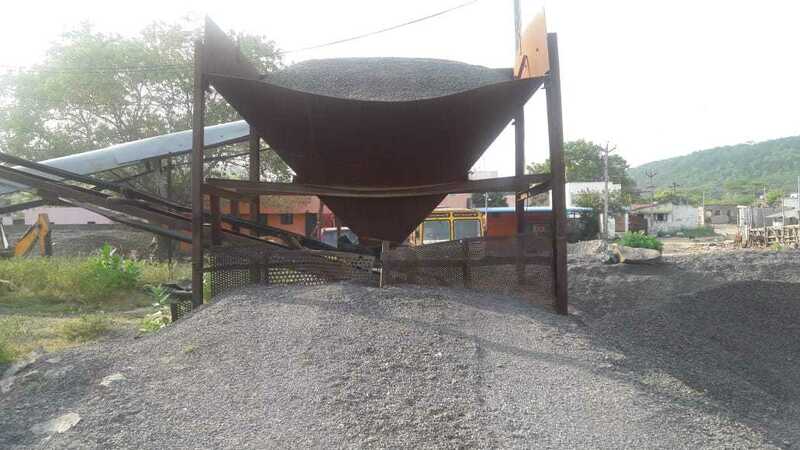 The blue metal that has been quarried from various parts are brought to the crushing units to make gravel that is then used in construction and road laying. The process is carried out in the open, with dust from the units released into the air in the surrounding areas. There are also units that produce manufactured sand (m-sand) in the area. The pollutants released have had wide ranging impact in the region. The residents complain of respiratory illnesses. “My child is six months old. We moved here two months ago and she has had breathing problems ever since. When I took her to the doctor, they said it was probably because of all the dust in the air in this area,” says Shanthi J of Samy Nagar 2nd Street. The adverse impact on health is a common refrain among all residents we spoke to. Wheezing, tuberculosis and asthma are the most frequent complaints. The tiny particles of dust are a constant fixture in the air, making them inescapable. None of the residents who interacted wore any protective gear such as masks. Locals allege that many of the rock crushing units – over 60 in number in the area – function without any clearance. They say that the units comply with requirements to minimise dust, such as usage of sheds and sprinkling of water, only on the days that officials visit for checks, if at all. At other times, the dust produced permeates the surroundings freely. The trucks that carry sand and gravel are all open too, leaving behind a haze of dust as the transport loads from the units. 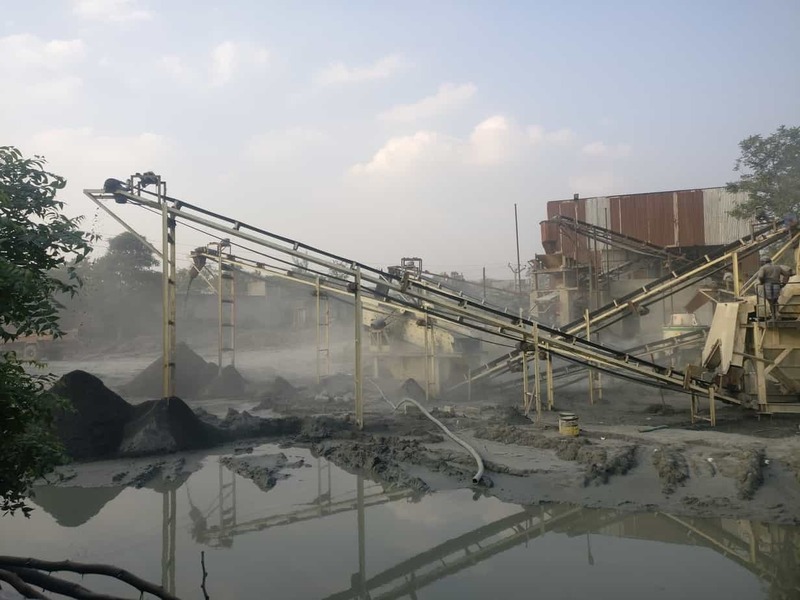 Residents held a protest a little over a year ago, demanding that the crushing units use water to minimise dust generated during the process. They staged a road blockade, prompting owners of the crushing units to negotiate with the residents. No authorities were involved in the process. The crushing units promised to sprinkle water regularly to prevent the spread of dust and to cover the trucks that transported the loads. The uneasy truce between the residents and the industry lasted a mere two months. “After the protests, the units kept their promise for around two months. Then they went back to their old ways. Water was not sprinkled anymore and the open top trucks were back,” says Ellaiammal. There have been no protests since, as many residents are reluctant to jeopardize their livelihood. “Many people here are actually employed at the crushing units and m-sand units. Even if they are badly affected and their families suffer from health issues, no one will speak against the crushing units for fear of losing their jobs. These jobs are all they have and finding employment in this climate is difficult. So people here live with the difficulties caused by the presence of the units,” says Devaraj N, a grocery store owner in Moovarasampet. With residents in a fix, the only respite from life clouded by dust could come from action by the authorities to curb pollution. The Public Relations Officer of the Tamil Nadu Pollution Control Board (TNPCB), however, did not offer much by way of hope. “It is likely that residents have built houses in the area after the rock crushing units have come up. There are restrictions on the operations of crushing units and procedures to be followed. But it is possible that the houses have been built between the crushing units in the past few years. We will have to look into this,” is all he says. 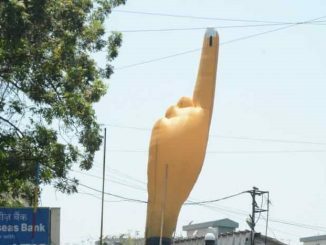 A small victory looming on the horizon is the possibility of a proper tar road for the residents. The current road is a dirt road that is ill-equipped to handle the daily stream of trucks carrying sand and gravel from the crushing units. 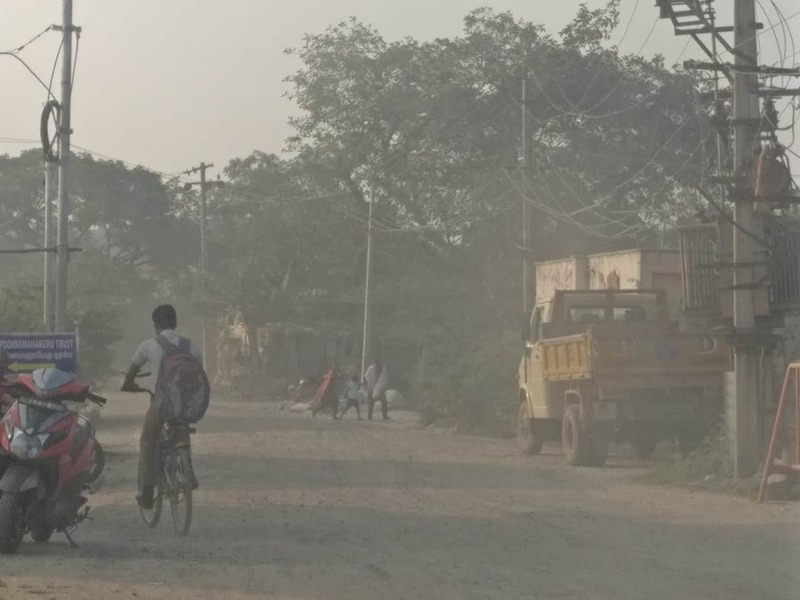 The heavy traffic also adds to dust pollution from the unpaved roads. The dust that lands on the road is difficult to clean and becomes part of the landscape. 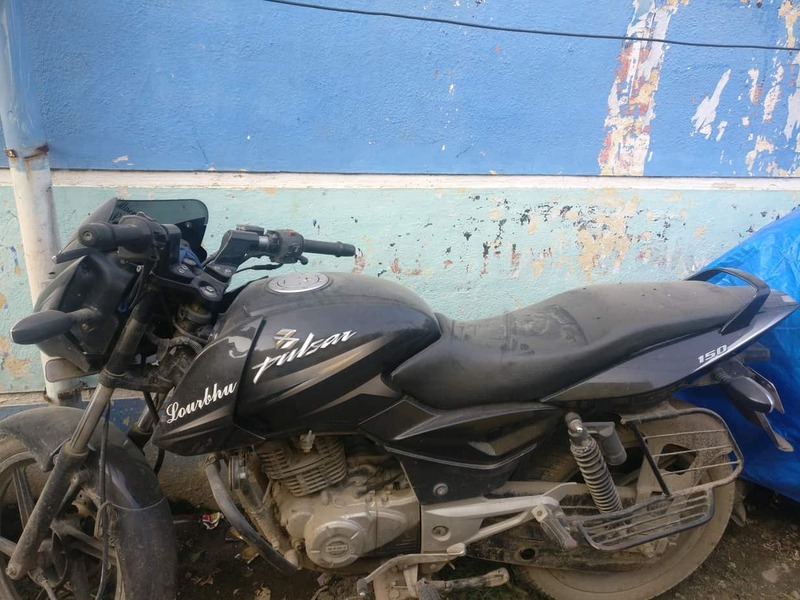 The residents say that they have word from the Pallavaram municipality that new roads will be laid within the next six months. Even as the larger conversation on air quality and the role of dust in it attracts increasing attention, many such local instances go unnoticed. Entire neighbourhoods suffer from the impact of polluting industries with little remedy available to them. With livelihoods often dependent on these industries and authorities not keen on action, many people find themselves resigned to life in conditions unsafe for habitation. Excellent article highlighting the threat to environment and to health as well by the stone crushing units. Hope the concern authorities and the policy makers will form guidelines on such units and take measures to control and prevent such health and environmental safety hazards through operations of such units in a warfooting way. Moreover such articles need to have higher visibility to the public and the government.